Before using formulas or academic vocabulary, showing students visuals to explore mathematical ideas can help facilitate discourse and understanding of broader relationships and truths. The use of multiple representations in students’ learning of mathematics can help give students ownership rather than teachers simply showing and telling them. Using Keynote, we can spark curiosity and understanding in our students without saying a word! 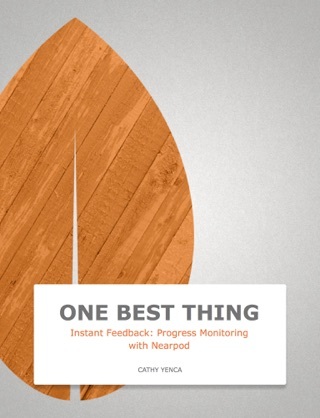 In this eBook, explore the WHY and the HOW of using Keynote (For Math) through research, tutorials, and inspiring, dynamic examples. Why not create a Keynote visual to launch your next math lesson? Why not share your creation using #KeynoteForMath and #EveryoneCanCreate on Twitter? We trust and believe what we can see. Learning math in school has traditionally not been a visually rich subject. It’s possible this lack of “seeing” is a contributing factor to our populations distrust of mathematical learning. Cathy Yenca’s beautifully crafted multi-touch book not only shows you why math teachers should use visuals to help student learn and see math but she walks you through how. 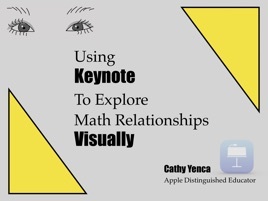 I’ll be using Keynote To Explore Math Relationships Visually in my teaching this year.